These aren’t the prettiest cookies you will ever make. They may not even be the tastiest. I am okay with saying that. My goal was to make cookies that were free of refined sugars, free of gluten, used coconut oil and tasted good (not “the best tasting cookie ever.”) I have had several requests from blog followers to feature more gluten-free recipes. However, I do not live a gluten-free lifestyle so I don’t continually pursue new gluten-free ideas which made this challenging for me. I was turned on to almond meal a few months ago and made some delicious blueberry muffins, but it incorporated whole wheat flour so it was not a gluten-free recipe. I thought I could use almond meal as a base and find a cookie recipe that would be easy, yummy, and gluten-free. I stumbled across this recipe when searching for ideas to use almond meal and made some slight changes and I am quite pleased with the end result. The cookies definitely have a different texture than I am used to — cookies made with flour. I am so accustomed to standard flour recipes that I am learning to appreciate new textures, which almond meal definitely provides. I do love the slight sweetness and the hint of cinnamon. It is refreshing to eat a cookie that hasn’t had chocolate chips or raisins added (which I add compulsively.) If you are living a completely gluten-free lifestyle, I think you will be really pleased with this cookie recipe. Few ingredients, simple prep and healthy! If you are NOT living a gluten-free lifestyle, these cookies will be a new experience. Give it a shot! You may find that you really like them! Reducing your (modernized) gluten intake will definitely give you positive results — you may not even realize that you were suffering from too much gluten (why am I bloated, again?) I personally have made conscious efforts to cut back and consume sprouted grains as much as possible. Melt coconut oil over low heat. While coconut oil is melting, combine and mix dry ingredients in a separate bowl. Once coconut oil is melted, remove from heat and add honey and vanilla. Stir and then add to bowl with dry ingredients and mix well. Place dough in fridge for about 1/2 hour. Pre-heat oven to 350 degrees so it is ready once your cookies are prepared. Remove from fridge and roll into 1/2 inch balls. Place onto cookie pan and flatten. Bake for 8-9 minutes – until edges start to brown. Remove from oven and cool on pan. This entry was posted in Desserts, Food and tagged almond, coconut oil, gluten free, honey. Bookmark the permalink. 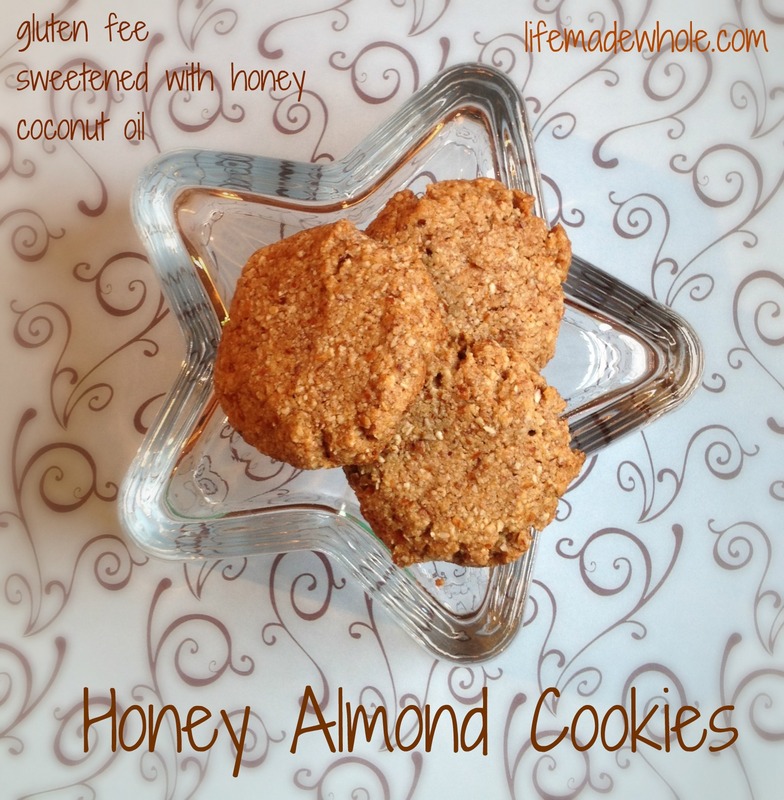 4 Responses to Honey Almond Cookies – Gluten-Free! Just made these and they are delicious..the chewiness was an unexpected and pleasant surprise…they really spread on my cookie sheet and almost became one big cookie with a honeycomb design..loved it!! Julie, thank you for taking the time to give your feedback on the recipe, I really appreciate it! I am so glad you liked these cookies!